Well, in my last post I wrote about the perils of floral foam and appealed to everyone to STOP using it! I’ve lots of designs which I regularly use and none of them use foam – here are some ideas and tips on how to create them for yourself. 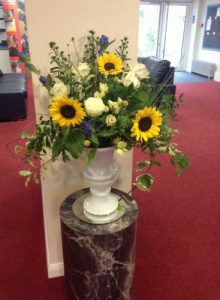 All of the vases and accessories are available to order from Chez Fleur so do get in touch if you see something you like! The cover photo is so simple but so stylish – simply fill 5 tall tank vases nearly to the top with water, take 5 aliums and cut the stems at an angle so that you can balance the stem inside the glass touching the water – they will look like they are floating! 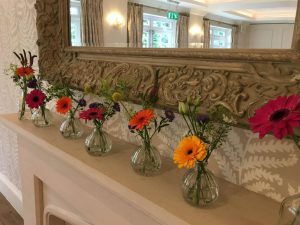 Here I have used small glass bottles with just a few stems of brightly coloured Germini to make a lovely mantle piece display! 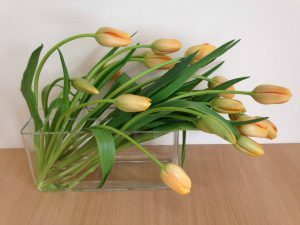 Here are two idea for displaying tulips – tulips keep growing after you have cut them so they are best displayed on their own rather than with other flowers where they will grow out of the design. 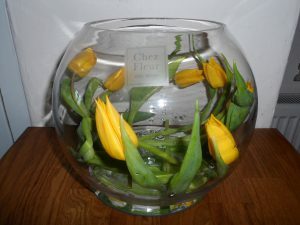 The first one using a glass fish bowl is super easy to make – just allow the tulips to wilt before wrapping them gently inside the bowl with a few cm of water. several lumps of foam – but there really is no need, the foliage works perfectly to anchor it all in place! 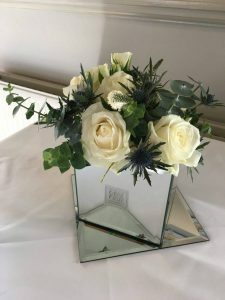 Inside this pretty mirror cube is a small pinholder – these are an old fashioned but perfectly functional way of arranging flowers – the circular holder is lead based with sharp pins which hold the foliage and flowers in place. The pins are available in many sizes and shapes and are a much more eco-friendly way to arrange table flowers.